National House-Building Council (“NHBC”, “we”, “our” or “us”) respects your privacy and is committed to the protection of your personal information. The controller is National House-Building Council (Registered Number 00320784) of NHBC House, Davy Avenue, Knowlhill, Milton Keynes MK8 5FP. We will collect and use your personal information to conduct our business, to provide access to our on-line portals, to enable you to set up and operate an account with us, in order to enable you to access, use and/or purchase our services and products, to undertake surveys and for the purposes set out in more detail in this section. Your information may be shared with other members of the NHBC Group and some third parties. Information when you communicate with us. We use Worldpay and Global Iris for payment services. If you purchase anything from us via Worldpay or Global Iris they will collect your payment information. You provide this information directly to Worldpay or Global Iris and we do not collect or store this data. Worldpay and Global Iris also collect identifying information about the devices that connect to their services. Worldpay and Global Iris use this information to operate and improve the services they provide to us, including for fraud detection. You can learn more about the how Worldpay processes your personal information at www.worldpay.com/uk/worldpay-privacy-notice and how Global Iris processes your personal information at https://resourcecentre.globaliris.com/privacypolicy. We also work closely with third parties such as various analytics providers and search information providers and may receive information about you from them. We may receive your data and information if you use services provided by other members of the NHBC Group. We may also collect information and content which you make publically available on your social media accounts. We collect and use your personal information for a variety of reasons. We need some information to enter into and perform our contract with you – for example your property details and any claims details in connection with claims under our Buildmark products, contact and payment details and registration details for builders and developers to ensure compliance with the NHBC Rules. Some information processing is required to comply with a legal obligation due to our anti-fraud and anti money laundering screening obligations or in the public interest such as making sure we verify our customers' identities. We are also required to process certain data in order to comply with the legal requirements placed upon us by the Insurance Distribution Directive ((EU) 2016/97). Your personal information may also be processed if it is necessary on reasonable request by a law enforcement or regulatory authority, body or agency, to enforce or apply the terms of any contract or legal obligation with us or in the defence of a legal claim. We will not delete personal information if relevant to an investigation or a dispute. It will continue to be stored until those issues are fully resolved. 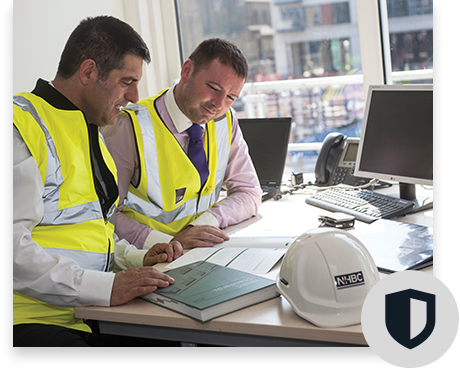 You can manage your personal data on a day to day basis through the NHBC preference centre. The preference centre is a portal for you to manage how we communicate with you and what we communicate to you. We will keep your information for as long as it is reasonably necessary. It will depend on factors such as statutory requirements which specify that certain data must be retained for specific periods (e.g. information provided in connection with Building Control), whether you have any outstanding claims, an account with us or have interacted with us recently. We will also routinely refresh our information to ensure we keep it up-to-date. If personal information is not provided we may not be able to provide information which you have requested or provide the relevant product or service for you. Certain types of personal information are more sensitive than others. This is known as "special information" and includes information about health and disability issues, ethnicity and religion. We may in certain circumstances collect or receive such special information. We have identified below details of the special information we may collect or receive and how we will use it. When you provide us with this information you are consenting that we may collect and use it in the way we have set out above. We will keep your information for as long as it is reasonably necessary in connection for the purpose for which such information is being processed. We will also routinely refresh our information to ensure we keep it up-to-date. Like many websites, this website uses a technology called 'cookies', which are small computer files that are placed in your computer's memory by the computer that provides or 'hosts' the website. Cookies are used to track data such as the total number of visits to the website. We use this information, which remains in aggregate form, to understand how our visitors use this website, so that we may improve the services we offer. They help us to improve our website and to deliver a better service. Some of the cookies we use are essential for the website to operate. NHBC does not use 'cookies' to collect personal identity information about you. More information about cookies used on our website can be found at http://www.nhbc.co.uk/Legal/Cookies/. We will take all reasonable care to keep your data secure and prevent unauthorised access to it. All information you provide to us is stored on our secure servers. Where we have given you (or where you have chosen) a password which enables you to access certain parts of our website, you are responsible for keeping this password confidential. We ask you not to share a password with anyone. Unfortunately, the transmission of information via the internet is not completely secure. Although we will do our best to protect your data, we cannot guarantee the security of your data transmitted to our website; any transmission is at your own risk. Once we have received your information, we will use strict procedures and security features to try to prevent unauthorised access. We may disclose your personal information within NHBC including to other members of the NHBC Group so that we can provide the best service across the NHBC Group. We may also share your personal information with certain contractors, suppliers or service providers. They may process your personal data for us, for example, remedial works contractors, loss adjustors and construction professionals. Our suppliers and service providers will be required to meet our standards on processing information and security. The information we provide them, including your information, will only be provided in connection with the performance of their function. Where we operate courses on behalf of third party training providers and principals we will pass your enrolment information and details of your performance to such third parties. Homeowner specific information from completed homeowner surveys may be passed to the relevant builder to the extent that you as the homeowner have elected to allow this in the survey form. We may also share your information with certain third parties either when we receive your consent (see above – "Why we collect and how long we keep your information") or because we need them to see your information to provide services or products to you. These include credit reference agencies, payment gateway providers, anti-fraud databases, screening agencies and other partners we do business with. We will only transfer data to jurisdictions within the European Union as appropriate safeguards are in place to provide an adequate level of protection for your information. We set out below the rights you have over your information and how you can exercise those rights. Some of the rights listed below will only apply in certain circumstances. In particular, they will generally not be available if there are outstanding contracts between us, if we are required by law to keep the information or if the information is relevant to a legal dispute. To exercise your rights you can email your request to our Data Protection Officer at dpo@nhbc.co.uk. Our website may, from time to time, contain links to and from the websites of third parties as a service to our users. If you follow a link to any of these websites, please note that these websites have their own privacy policies and that we do not accept any responsibility or liability for these policies. Please check these policies before you submit any personal data to these websites.